There are 24 Memory Care Facilities in the Lilburn area, with 1 in Lilburn and 23 nearby. The average cost of memory care in Lilburn is $3,073 per month. This is lower than the national median of $4,650. Cheaper nearby regions include Lawrenceville with an average starting cost of $2,809. To help you with your search, browse the 15 reviews below for memory care facilities in Lilburn. Better rated regions include Norcross with an average rating of 4.8 out of 5 stars. Caring.com has helped thousands of families find high-quality senior care. To speak with one of our Family Advisors about memory care options and costs in Lilburn, call (855) 863-8283. In Gwinnett County, Alzheimer's affects an estimated 11.6 percent of seniors age 65 and older. Around 1,000 of Lilburn's more than 10,000 residents belong to this age group, who are the most likely to develop cognitive impairments. When the disease progresses, affected seniors may require more intensive care than families can offer at home. Memory care facilities may be able to help by providing compassionate care in a safe, home-like environment. Georgia licenses these so-called memory care units as part of an assisted living community or personal care home. Although there are no memory care units in Lilburn, the city is served by 16 in nearby towns, including Tucker, Decatur and Atlanta. When considering a memory care facility, families may want to know whether it's in an area that is generally regarded as safe for seniors. Lilburn, with a rate of 380.8 violent and property crimes per 100,000 residents, ranks among the safest cities in Georgia. People 62 years of age or older who live in Lilburn qualify for the Georgia retirement income exclusion. Between the ages of 62 and 64, this exclusion enables seniors to avoid paying taxes on up to $35,000 of their yearly retirement income. When retirees reach 65, the exemption increases to $65,000 per person. These retiree-friendly tax policies may be particularly helpful for seniors facing memory care expenses. In the event of medical emergencies or illness, the Lilburn area is home to world-class medical facilities, including Emory University Hospital in nearby Atlanta, which is nationally ranked in the specialty of neurology. Lilburn's overall cost of living is 3 percent higher than the U.S. average, but this difference is mainly due to higher housing costs. In most expense categories, Lilburn compares favorably to the rest of the country. Healthcare, for example, is about 9 percent cheaper in Lilburn than the national average, a savings which may help families afford memory care. Memory Care costs in Lilburn start around $3,073 per month on average, while the nationwide average cost of memory care is $4,800 per month. It’s important to note that memory care rates in Lilburn and the surrounding suburbs can vary widely based on factors such as location, the level of care needed, apartment size and the types of amenities offered at each community. 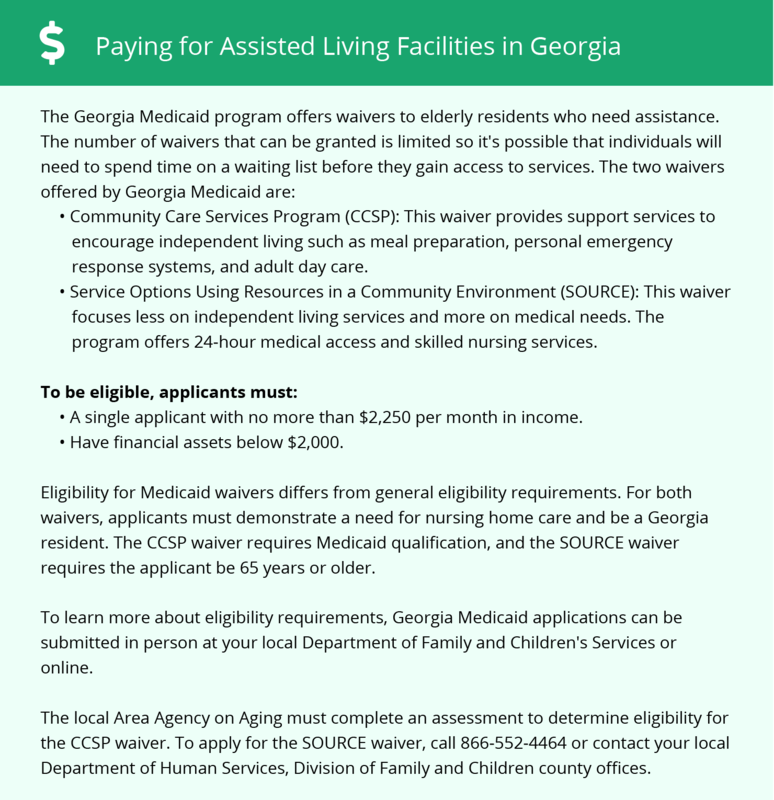 Lilburn and the surrounding area are home to numerous government agencies and non-profit organizations offering help for seniors searching for or currently residing in an assisted living community. These organizations can also provide assistance in a number of other eldercare services such as geriatric care management, elder law advice, estate planning, finding home care and health and wellness programs. To see a list of free memory care resources in Lilburn, please visit our Assisted Living in Georgia page. Lilburn-area assisted living communities must adhere to the comprehensive set of state laws and regulations that all assisted living communities in Georgia are required to follow. Visit our Memory Care in Georgia page for more information about these laws.